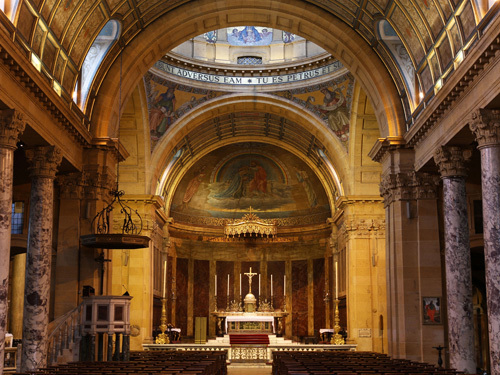 "Little Rome in Birmingham", the Oratory Church was built between 1907-1910 in the Baroque style as a memorial to Cardinal Newman, founder of the English Oratory. Donations to the Oratory Church Restoration Fund welcome, and requested of tour groups. At other times, entrance can be obtained via the Oratory House. Repository shop selling a selection of books, CDs, DVDs, cards, medals. Open on Saturdays and Sundays after Masses. Guided tours of the Church and Shrine of John Henry Cardinal Newman by arrangement. School and university visits by arrangement. For times of Mass, please see the website. Disabled access via car park. Train: trains to Birmingham city centre (New Street, Snow Hill or Five Ways stations). Bus: numbers 9, 120, 126, 127, 128, 129, 140, 141, etc. Car/coach: On the main A456 road from Birmingham to Kidderminster. 1 mile from the city centre. Cars: Car park entrance on Plough and Harrow Road. On-street parking on Plough and Harrow Road on Sundays.